We need to repeat a behavior many times for it to become a habit. Our willpower is a limited resource, so any behavior change based on willpower alone is destined to fail. Every instance of a new behavior requires “activation energy” – an extra mental and physical effort that you need to overcome inertia and start a new positive habit. Take a moment now to articulate why you want to do your home yoga practice regularly. Statements like “It’s good for me” or “A yoga teacher should do it” are not particularly motivating. What motivates you right now and connects to your highest values, or has a sense of urgency? Pain somewhere in the body can be a great motivator. Or maybe you deeply value the connection that you make with your yoga students – you can use that to motivate you and inform your yoga practice. Or maybe you find yourself being antsy and mildly irritated lately and you don’t like to be that way – this can be motivating to do a regular yoga practice. Maybe you feel yourself dragging though your day and this is not how you want to be. What kind of great things could you accomplish if you had more energy? Imagine all the possibilities and use them as motivating factors. Personally, I am using my personal yoga practice to inspire myself. I think of myself as a creative person and I love coming up with new fresh ideas for my blog, my teaching, and for how I run my business – my personal yoga practice gives me that in spades. Right now, this is my why-factor. What is yours? You can write it down on a post-it and stick it somewhere where you will see it often (on a refrigerator, or your computer, or the bathroom mirror, etc.) This is also a great service that you can do for your students – to help them identify their why-power and motivate them to do their own home practice. 1. I moved my first morning client that I have every day to start 15 minutes later to give me some extra time – she didn’t mind. 2. I put on my walk clothes when I get dressed in the morning – that way I am always ready to go. 3. I put on my walking shoes when I go to drop off my son. That’s it! Now all I have to do is turn left (to go for a walk) instead of turning right (to go home) every weekday after I drop my son off – it is so easy to do that I haven’t missed a single day since I started doing it on January 3. Now my morning walk is a default choice and doesn’t require any effort for me to maintain. 1. Pick a specific time slot when you will do your home yoga practice and for how long. It is best to “hook it” to an activity that you are already doing – right after you get up, after shower, right before lunch, right after work, right before bed, etc. After activity generally works better than before. I like to have a backup slot, too. For example, I usually do my practice at 11.30am, right before lunch. If I happen to have other commitments during that time on some days, my back up slot is 3.15 pm, right after I pick up my son from school. It’s nice to have a backup. 2. Set up your space ahead of time. If you want to practice right when you get out of bed, roll out the mat next to you bed, so that all you have to do is step down on it. If you want to practice at some other time, roll out your mat in a place where you can see it, to serve as a visual reminder. Basically, put the mat in your way so that it’s easier to just step on it and practice than to avoid it. It doesn’t matter where you practice, as long as you do it. 3. Put your yoga clothes on ahead of time. Depending on your work arrangements and other commitments, you can either put on your yoga clothes first thing in the morning, or change into them at lunch, or put them on before you leave work, or first thing when you get home – this is just another reminder for you to get moving. 4. Have a plan for what you will do for your practice. That plan doesn’t have to be rigid, but it needs to be connected to your why-power. What will you do? Will you come up with a practice on the spot or will you use a pre-designed sequence? If you want to be more creative in your practice, then it makes sense to design a practice on the spot based on how you feel on that particular day. If you want to address a specific physical, energetic or emotional issue, it’s better to have a plan, so that you don’t end up drifting in the sea of possibilities. Predesign your practice, do the same practice for a while, or use my yoga app or any other practice resource you like to pick a targeted yoga practice that relates to your why-power. 5. Minimize distractions. Identify activities that get in the way of your practice and put intentional barriers to those habitual behaviors. Just make it harder for yourself to do it. If you get distracted by email on your computer, close your email client and only open it when you need to check email. Turn off your phone, hide your iPad, take the batteries out of your TV remote, etc. The barrier doesn’t need to be huge. If it takes 20 seconds longer to go find the iPad that you tucked away than it does to sit down on your mat, you are more likely to get to your mat. 6. Make conscious choices. If you catch yourself being occupied with other things and leaning toward skipping your practice on any given day, just close your eyes for a moment and ask yourself – what is more important right now? Should I watch another 15 minutes on Netflix (or whatever) or should I do 15 minutes of yoga? Which one will bring me closer to my why-power intention? Then make a conscious choice, whatever it is. Do it every time you find yourself reverting to your old habits. Here is a simple home yoga practice worksheet that you can use to help yourself establish a consistent meaningful home yoga practice. Good luck with building your new habit! Next week we will feature a short simple routine that you can use to jump-start your home yoga practice. Tune in! 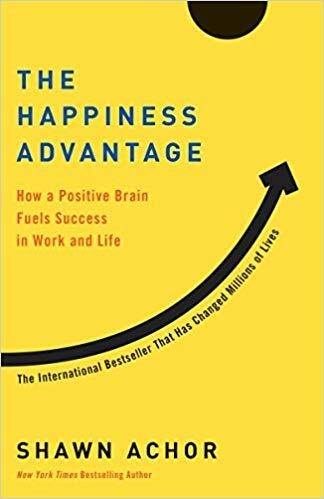 We will be reading The Happiness Advantage: How a Positive Brain Fuels Success in Work and Life by Shawn Achor next month on Happy U. It is a wonderfully positive book written in a simple and engaging manner. It outlines some very specific and doable strategies that we can employ to become happier at work and in life. I found it very inspiring! Sign up for Happy U weekly newsletter and join our discussion about the book! really clear, practical and helpful. I was listening to a podcast a couple of days ago which presented a similar approach. thanks for the clarity. Great when we make things easier for ourselves and more meaningful to our lives. Thank you Paul! Those simple principles are applicable to so many things – I am currently using them for all sorts of exercise, business, yoga and relationship-related behaviors. They work! Very interesting and informative post!! Previous story Why is it so hard to have a consistent, meaningful and inspiring home yoga practice?